Necky's Revenge is the boss level of the Chimp Caverns, the sixth and final world of Donkey Kong Country. The Kongs must beat the titular giant vulture Master Necky Snr., a harder palette swap of Master Necky, to progress to the final battle with King K. Rool on Gang-Plank Galleon. As with all world boss fights in Donkey Kong Country, the fight takes place in an arena filled with bananas, in this case within a single screen; and if the player enters with a single Kong, a DK Barrel is instantly broken to ensure they start the fight with both Donkey and Diddy. A single tire is embedded in the center of the arena. In the battle, Master Necky Snr. 's head at first emerges at a random height from either the left or right of the screen and spits a coconut at the Kongs. 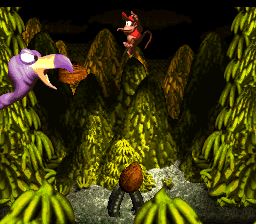 To defeat this enormous bird, Donkey or Diddy must use the bouncy tire in the middle of the bird's banana lair to jump up to stomp Master Necky Snr. 's head. Unlike in the earlier battle, Senior shoots increasing numbers of coconuts after each hit - after two hits, he shoots three coconuts, etc. - and is invulnerable until he has finished spitting; his coconuts also fly farther and faster. After five hits, Master Necky Snr. collapses and the Kongs recover their sixth Giant Banana. As with Master Necky in Necky's Nuts, the player never gets to see Master Necky Snr. 's whole body; only his head appears on the screen. In the Game Boy Advance port of Donkey Kong Country, Necky's Revenge contains both Master Necky and Master Necky Snr. working together on defeating the Kongs. Both of them shoot a nut at the Kongs. After one is defeated, the other shoots four nuts at a time. When Donkey Kong and Diddy Kong jump on them both five times, they will be defeated. The level in the Game Boy Advance version. Master Necky appears alongside Master Necky Snr. Master Necky resumes the battle after Master Necky Snr. is defeated in the Game Boy Advance version. This page was last edited on April 12, 2019, at 04:00.